Cannes rings in our memory because of the Festival de Cannes (Cannes Film Festival), the annual cinema fête held each May. 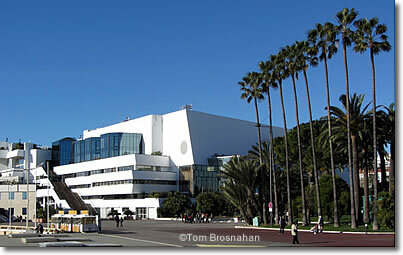 The stars and hangers-on of the cinema world flock to Cannes and its Palais des Festivals et des Congrès right on Le Vieux Port (the Old Harbor). 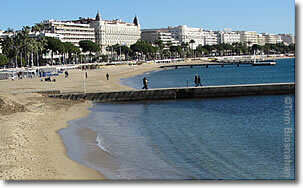 Cannes's palm-tree-lined waterfront corniche east of the Old Harbor is called the Boulevard de la Croisette, passing the Plage du Festival (map), restaurants, grand hotels, and some of the more prominent villas. 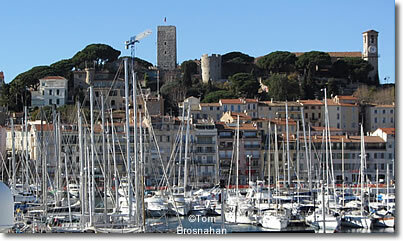 The historic district of Cannes at the northwest corner of Le Vieux Port (the Old Harbor) takes its name from the rue du Suquet, the narrow stone-paved lane that winds uphill to the Église de Notre-Dame -de-l'Esperance (Our Lady of Hope Church). This is the oldest part of town, the original fortified fishers' settlement. Today the rue du Suquet is lined with little restaurants and shops, and is a major point of interest for visitors to Cannes. Boulevard de la Croisette & Plage du Festival, Cannes, Côte d'Azur, France.